This entry was posted in Projects and tagged Analog, Cisco, E/M, Linking, Quantar, VIC. Bookmark the permalink. Be careful with older 2600 and original VIC-2E&M cards. 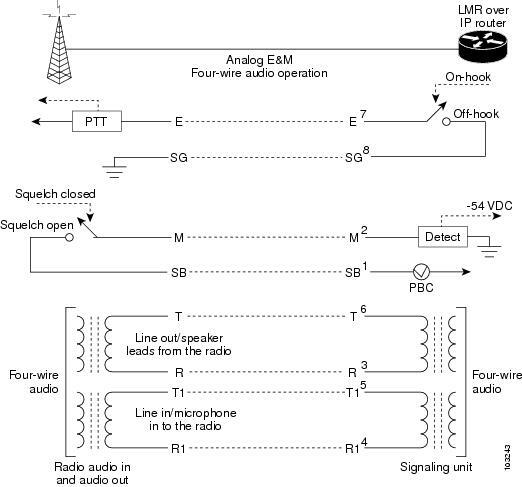 While I have not verified this myself it was mentioned to me during some of my experimentation that when the router reboots the signal levels on the E&M leads will change. This can result in a station keying while the router reboots. If you have used a 2600 you know that is not a short period of time. The configuration above makes mention of “bootup e-lead off” which I believe (and I’m sure it’s the internet so someone will correct me) resolves this issue but only in the VIC2-2E&M cards in the 2800/3800 series routers. I just set up a system following your page and i cant get any audio to pass-through the quantar, the cisco side of it all works great. but no audio in the wireline out to the xmtr. If you like I can send you the Quantar code plug that we are using so that you can compare it.